The story has been told of Ikimot, the young girl who went missing for five years before returning home again. 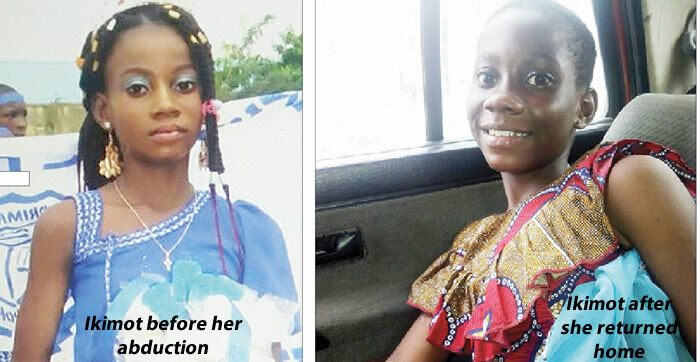 The joy of the family of Ikimot Awojoju knows no bounds as she has been reunited with her family in the Oyingbo area of Lagos, five years after she went missing. It was gathered that Ikimot lived with her guardian after her mother, Faidat Awojoju, passed away. She reportedly went missing on her way back from school on July 23, 2014. Ikimot’s guardian, Ajoke Abass, said she sold her valuables to raise the money needed to search for her but all efforts to find her proved abortive. The Kwara State indigene said Ikimot’s return was an indication that her prayers were answered as everyone had assumed that she was dead. The mother of four said, “Ikimot’s mother was an area sister to me and we took each other as family members. She already had a child before she got pregnant with Ikimot. The man responsible was not ready to accept the pregnancy and she wanted to abort it. I advised her against it and stood by her throughout the course of the pregnancy until she put to bed. PUNCH Metro gathered that another child was also recovered from the suspected abductor, Christiana Onuchukwu, who eventually allegedly confessed to the police to have bought the children for N350,000 each. “The 12-year-old girl, who was released to me on Monday, said she found her way back by asking people for direction,” Abass added. Ikimot was quoted as saying, “On the day I was abducted, I was on my way back from school when a woman called me. When I went to meet her, she held my hand and took me away. One day, the woman I was made to live with (Onuchukwu) scolded me by saying that she would take me back to my family in Oyingbo and I held on to that. The state Police Public Relations Officer, Chike Oti, said investigation into the matter was ongoing. “The girl has been reunited with her family. The woman that was found with the children has been arrested and investigation is ongoing,” he stated.